Jazz guitarist Luca Di Luzio has concentrated his musical activities so far on his native Italy. This changes fundamentally with his new project Globetrotter (2019). The title is program and the list of musicians involved is more than illustrious. Beside Jimmy Haslip, as producer and bass player, are performing Dave Weckl on drums, George Whitty on keyboards and Max Ionata on tenor saxophone. The album contains six originals and two traditional standards. The album has biographical traits, as all six pieces written by Luca refer to periods of his life that have left their mark on him. The first tune Smile! is a contemporary re-arrangement of a song Luca composed several years ago. Certainly also through the passion of highly professional musicians, the simple melody has an impressive groove that sets it apart from the mass products. Of course Dave Weckl's drum solo is the highlight of this piece. Mr. Brown is dedicated to guitarist Dean Brown, Luca's incredible supportive mentor. Like many other musicians Luca Di Lorenzo was not always a fulltime musician but had a conventional occupation. The Jazz Fusion piece Jazzlife reminds of the fundamental change in his life direction. The ballad Buena Suerte (Good Luck) reminds us that not only a professional attitude is crucial to life, but also the famous bit of luck. Elisir (Elixir) is a combination of two melody strings propelled by a Latin flavored percussion. Influential jazz pianist Kenny Barron has written Sunshower for his album Innocence (1978). Luca's adaption is closely aligned with the original. The Latin tinged Pop Fla was inspired by Luca's stay in Florida some years ago. Keyboardist George Whitty and especially drummer Dave Weckl provide the changing rhythmic frame. The ballad Naima was composed by John Coltrane named after his wife, Juanita Naima Grubbs. It was released on the legendary album Giant Steps (1960). Luca re-harmonized the theme in chords and changed the original tone in order to use guitar open strings. Jimmy Haslip's bass line perfectly interferes with Luca's smooth guitar performance. 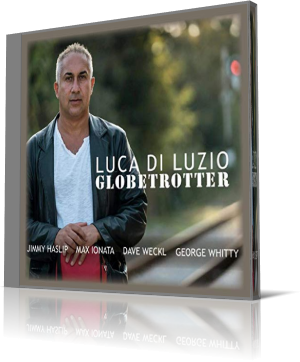 With this outstanding team of international artists Luca Di Luzio has created a shining gem of contemporary jazz. We can be curious whether Luca will set a sign with this group at live performances as well.